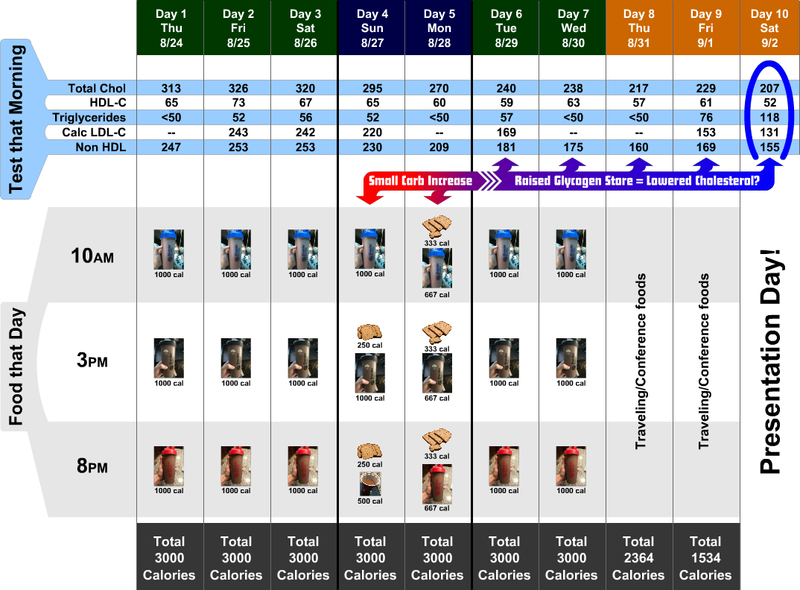 Back in May, I wrote on my isocaloric carb swap experiment where I had 3,000 calories/day of keto shakes for five days, then “swapped” out 500 calories of the shakes for 500 calories of bread for the following five days. The first five days I averaged 30g of carbs, but the second five days I averaged around 95g of carbs. This resulted in a massive drop in my total and LDL cholesterol. In fact, it was much more pronounced than you’d have expected given I had only added a net 65g of carbs, which I go into detail on in the blog post. So this brings us back to the general theory again: It’s about the energy, not the cholesterol! Okay, so much of what you’ve read on this blog centers around my research regarding the Inversion Pattern. The Inversion Pattern shows the impact of cholesterol numbers in the short term based on diet. And indeed, it has a very significant relevance to what shows up on your cholesterol test. Yet, what of the “baseline” numbers the Inversion Pattern is starting from? Why would my and many others’ cholesterol go up on a low carb diet to begin with? While theoretical, I’ve contended for some time that this makes sense on the part of the body when lacking “energy in the tank” of glycogen and adipose stores. 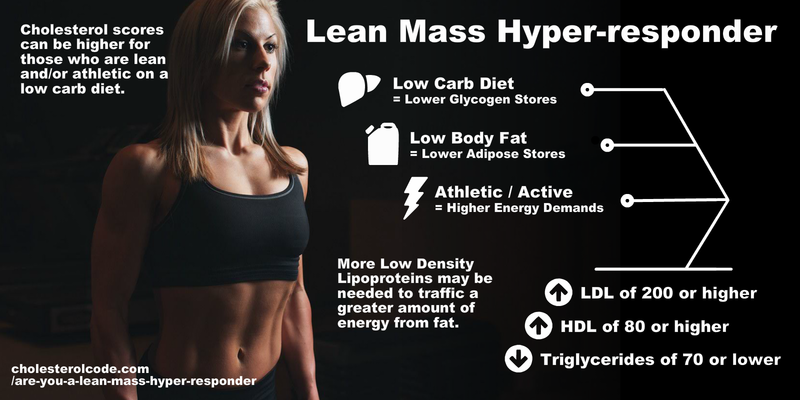 If you’re lean and on a low carb diet, the less body fat (adipose) and lower carbs (less relative glycogen stores) may mean the body has reason to mobilize more fat-based energy on hand (LDLp). That appears to get further confirmed by the Lean Mass Hyper-responder pattern. So how to prove/disprove this? 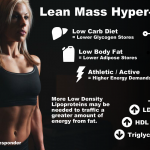 Simple – fill up those glycogen stores! So again I decided to do the 3,000 calories of shakes per day. These were chocolate Ketolent shakes courtesy of Keto and Co. But this time, I decided to do only two days of swapping bread to spike the glucose (Day 1: 500 calories / 70g net carbs from bread, Day 2: 1,000 calories / 140g net carbs from bread). Then I’d follow up for two days again with the keto shakes and no added carbs. Obviously, if the drop in cholesterol was only due to the carbs eaten in that short window of time, then it would bounce back in the days afterward. On the other hand, if glycogen was the key and I was topping off its stores above my normal keto diet levels, then we should see the cholesterol drop for much longer, right? So as you can see, following my intervention days of four and five, days six through ten showed a gradually declining total and LDL cholesterol. Where LDL couldn’t be calculated due to Triglycerides being under 50, we can see Non HDL as a decent surrogate. I would have continued the keto shakes for days 8 and 9 as well, but travel made it too difficult. That said, I did mean to eat closer to 3,000 calories on both days, but that didn’t end up happening. As an aside, this actually gives even further weight to the energy status theory as we’d expect the Inversion Pattern to increase my total and LDL cholesterol following these days. Since I kept the total calories to 3,000 throughout the seven day period, we can generally rule out overall energy surplus or deficit, which is important for many reasons — particularly regarding the Inversion Pattern itself. As mentioned above, it appears a higher energy status (more relative glycogen stores) means the body feels less need to mobilize more energy from fat (triglycerides) in LDL particles. And since cholesterol “ride shares” with triglycerides in the same LDL boat, they don’t circulate as much either – meaning less LDL cholesterol for the blood test to pick up. In my presentation, I got to show off the success of my experiment yielding an LDL of 131, “the lowest I’ve had since starting Keto.” This garnered a big applause. But this was less an accomplishment than a demonstration. I’m sure many will read this and appreciate it as a possible way to lower their total and LDL cholesterol scores. And to that end, I’m happy to bring more research to give people that option if it can work for them. But as with before, I don’t assume any specific cholesterol score as optimum. In fact, the dynamism around energy that my research is exposing should be putting this even further in doubt. I am definitely in this category so thanks for offering a simple explanation and a simple test. Sure thing, Jeremy — happy to help. According to my personal data on insulin load, your first carb day pushed you (me) close to the Randle Cycle peak but not over. The second day pushed you (me) over. 1. As you say you are building up your glycogen stores so less need for TG. 2. You are switching from fat burning to glucose burning a la the Randle Cycle, albeit the very early stage and you can start to utilize plasma glucose and stored glycogen more avidly. It would have been interesting to see fasting or postprandial glucose as I experience a decrease in fasting glucose once past the peak even though insulin load/carbs are still increasing. This I think is caused by the decrease in physiological insulin resistance in muscle and adipose so a greater appetite for glucose accompanied by a relative inhibition in fat oxidation. This is truly fascinating to me as I am in that LMHR category, using low carb to keep my weight down but also noting significant increase in my LDL. I know I see weight increase with increased carbs. What have you seen with your weight with the different experiments? Overall, my weight is pretty locked into around 180lb (I’m 6’3). When going high caloric, it can increase slightly, but quickly drops off when the experiment is over. Carbohydrates serve primarily as a link to synthesis (nucleotides DNA, RNA, amino acids, fatty acids, cholesterol, pyrimidines, purines) as reducing agent (NADPH2- thyroid, transport through cholesterol cell membranes – electrons, transport of hydrogen derived from fat). With high energy potential of AMPK cells caused by exogenous or endogenous fats, the cell is closed to cholesterol,oxaloacetate,free fatty acids, etc. It is a natural safeguard mechanism so that people do not harm themselves in cardiovascular, mitochondrial, neurological diseases. To be sure, my concept is one more of systems-level regulation over pathway-specific regulation. There are a number of pathways such as the ones you outline that are likely in play, but this doesn’t mean they are authoritarian to the overall status of the elements themselves (in this case, LDLc/p). Which is why I think we continue to see a homeostasis with my data until certain threshold points (as seen with the experiment in May, for example, http://cholesterolcode.com/cholesterol-research-breakthrough/). If the relationship in these elements were far more dose-dependent, then their change would be much more linear in relationship to each other in quantity. Your LDL numbers are still way high. I don’t know if you have written about this before, but if you did feel free to link me to that post 🙂 If you are a cholesterol hyperresponder, are you aware of any long-term research showing that you can stay healthy with these elevated numbers? I have a client who experienced a doubling of cholesterol, trigs and LDL numbers on essentially zero carb while losing weight and fat mass – and overall feeling much better. But his resting HR is elevated, his ApoB is elevated, and the doctor wants to put him on statins, so it is impossible for me to advise him to stay on the diet. He is going to try a few days of higher fat intakes prior to another test to see how things turn out. That’s the essential question of this research overall. If you feel great on low-carb, but have have LDL, are you healthier? I wrote up a bunch of other metrics that try to answer that question. In addition, a CAC score provides great feedback on how much damager your arteries have accumulated. Borge, see the Phinney paper about transient LDL rise during weight loss – he saw this on a low fat, low calorie diet. This might help, as the statin question is discussed. There is a lot of cholesterol in fat stores, it is released during weight loss and as it can’t all be excreted at once is recycled for a while. Given the higher TGs, you are certainly seeing recycling from adipose through liver and this won’t last once weight is stable. Resting heart rate is probably elevated by sodium loss on keto (this is normal side effect of a low-salt diet), so will respond to extra salt. If your insulin is low your macrophages aren’t nearly as interested in taking up or holding on to that extra LDL. LDL and ApoB goes up when lean people fast, the longer they fast the higher it goes, so does anyone think fasting causes heart disease? In any case, even the conventional thinking is that it takes 10-20 years of high LDL to cause atherosclerosis, and that’s in the usual unfavourable metabolic milieus. Statins for a self-limiting condition like weight loss seems excessively heavy handed. Hi Dave, did you measure your glycogen levels? How long does it take for it to fall back to keto levels? I have followed and understood all the previous explanations, but I’m unable to follow your explanation for this one. Direct measurement of glycogen levels requires a tissue sample (from liver or muscle). In this case, I assume Dave is inferring his glycogen storage status because that’s where excess CHO are stored. Indeed, I *wish* I could easily measure my glycogen stores. But there’s no easy way to do this, much less in *both* the muscle and liver tissue simultaneously. Thanks Dave. Does this also have a memory? Eg, does the LDL depend on say the glycogen stores of the 3 consecutive days of the past 5 days? Been reading your blog posts more carefully recently because I also had some weird numbers. I started LCHF a little over 6 months ago. I have been feeling great and have lost 20 pounds from 214 down to 194. When I started on LCHF, I was on trilipix for triglycerides and Lipitor for “cholesterol” prescribed by my doctor 5 or 6 years ago. I stopped both medications after a month on LCHF. My numbers last year, 9/2016, were 157 tot chol, 31 hdl, 182 triglycerides and 90 for ldl. I just had the same blood test done, 9/2017, and the results are now 317 chol, 31 hdl, 222 triglycerides, and 245 ldl. I was fully expecting that at least my triglycerides would have been way down but every number, except the unchanged hdl, went in the wrong direction with a vengeance!! This did freak me out because it is nothing like I have read over the last 6 months on all the LCHF sites. I have my annual physical tomorrow morning and I’m sure my doctor is going to give me a tongue lashing. Do you have any insight based on the limited info I have provided here? Unfortunately, I don’t have a lot of insight to add here as I don’t have much experience or data with the effects of long term cholesterol medication. Going off it five months ago *might* have washed out the difference in your numbers, might then again, maybe it didn’t. No easy way to know since no one is doing much studying in this area (certainly statin companies wouldn’t be!). With that said, I would check into your diet a bit closer. Usually with TG that high and HDL that low when LCHF there are often a number of “leaks” where you may be having more carbs than you thought. Going high fat while *also* having hidden carbs will often leave more TG parked in the blood. How does the liver know the glycogen status to adjust ApoB and ApoA1 output accordingly? It can monitor its own status, plausibly, but probably not muscle stores. A glycogen-full parenchymal cell could well release a marker – or the flux of lactate from glycogenolysis could serve? That’s my theory in a nutshell. I suspect the liver is making this decision locally. Naturally, I’d love to have a way of monitoring my liver glycogen stores to be sure (that, uh… didn’t require multiple biopsies…). Regardless, I’m pretty confident I upped my glycogen stores relative to where they were at in days 4 and 5 from the modest carb loading. The larger question is whether I was able to maintain that higher level for longer due to already having a greater fat-based energy preference (and thus greater glucose sparing preference). So if I’m correct in how I read this there is two ways to drop LDL. 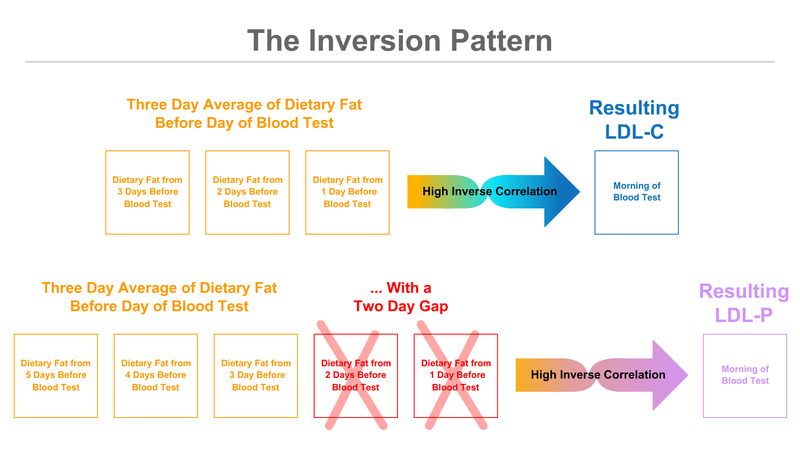 1 is through your inversion pattern where you smash the amount of fat you eat so you create less LDL since your chylomicrons are high due to the fat. Or 2. you are already fat adapted and increase your carb content for a couple of days which puts you in energy surplus meaning you no longer need as many LDL’s right? Worth noting –> you’d likely need to “swap” your carbs in place of fat as I did. I speculate adding carbs to the existing load of fat would be less likely to have the desired effect. I get the 2 methods of reducing the LDL levels; however, I note that your day 10 results show that the TG/HDL-c ratio have risen. Since I think I have just about convinced (or worn down) my doctor that the important metabolic lipid metric is the TG/HDL-c ratio, coaxing him to ignore my ‘suicidal’ 6.4 mmol/l (247mg/dl) total cholesterol . . . I would not like to jeopardise things. So, for my next blood test appointment early next year I am going to go for method 1; I and plan to stack up on fats for 3 days (fortunately I love macadamia nuts and my olive oil mayonnaise) . . . Just to see how he reacts. what would be the simplest way to drop cholesterol numbers for an Insurance test. I am keto for over a year . should i do stage one of your test or stage 5 ? or something different ? thank you for your help and research . amazing !!! The easiest would likely be the Feldman Protocol. I am on LCHF since last 4 month. My LDL was 145 AVR last 5 years but my HDL always less 20 , even with LCHF still my HDL below 20 . Any explanation for this low HDL?